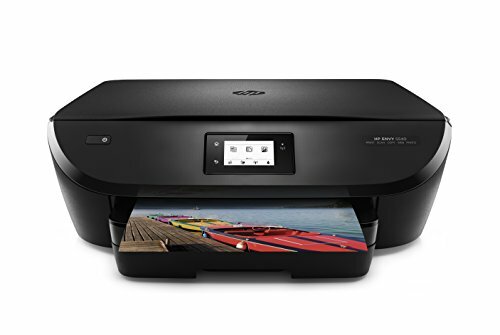 You can afford to be creative with HP Instant Ink: Save on Original HP ink—ordered by your printer—and print photos and documents for the same low price. Get high-quality prints—time after time—with an all-in-one designed and built to be reliable. Print more for less with Original HP high-yield ink cartridges. Easily create, without the wait: Snap. Print. Enjoy. Easily print lab-quality photos from a variety of smartphones and tablets. Start printing and get connected quickly with easy setup from your smartphone, tablet, or PC. Manage printing tasks and scan from your mobile device with a free HP All-in-One Printer Remote mobile app. Make quick work of creative tasks: Be sure your projects always look good. Print borderless, lab-quality photos and laser-quality documents. The built-in photo tray lets you print 4x6-inch photos in brilliant color without changing paper. Print remotely without worries—the auto-deploying output tray keeps your pages from landing on the floor. Make it easy: Print photo projects, or scan and copy documents, using the 2.2-inch (5.5 cm) graphics touchscreen display. Easily print at up to 12 pages per minute (ppm) for black-and-white and 8 ppm for color. Print in any room you choose—without causing disruptions—using the optional quiet mode. Choose an ink replenishment service: Let your printer track usage and have ink delivered before you run out. Either reorder Original HP 62 ink cartridges only when you need them through Amazon Dash Replenishment, or save up to 50% by paying for pages printed through HP Instant Ink.